Body length to height is approximately a 10 to 9 proportion, thus appearing slightly longer than tall. It is a heavy boned and well muscled dog of sturdy appearance. The topcoat is black. The markings are rich rust and white. Symmetry of markings is desired. On the head, rust typically appears over each eye, on each cheek and on the underside of the ears. On the body, rust appears on both sides of the forechest, on all four legs and underneath the tail. 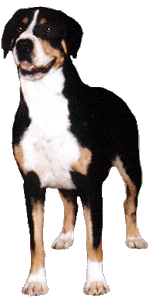 White markings appear typically on the head (blaze) and muzzle. The blaze may vary in length and width. It may be a very thin stripe or wider band. The blaze may extend just barely to the stop or may extend over the top of the skull and may meet with white patch or collar on the neck. Typically, white appears on the chest , running unbroken from the throat to the chest, as well as on all four feet and on the tip of the tail. White patches or collar on the neck is acceptable. Any color other than the "Black, Red and White" tri-colored dog described above, such as "Blue/Charcoal, Red and White" or "Red and White" is considered a disqualification. 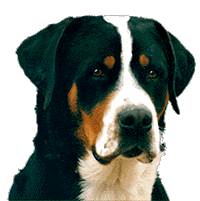 When evaluating the Greater Swiss Mountain Dog, markings and other cosmetic factors should be considered of lesser importance than other aspects of type which directly affect working ability. 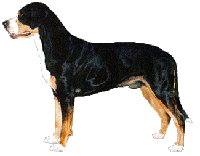 Any color other than the "Black, Red and White" tri-colored dog described above, such as "Blue/Charcoal, Red and White" or "Red and White". Blue eye or eyes.